Looking to organise a Hen Party in Belfast? For a truly unique and fantastic hen day out in Belfast, our Hen Party Belfast package has a variety of activities to entertain you, on your hen night or hen weekend party. This daytime activity may be a pre-cursor to your hen night out in Belfast. Our hen party package is designed to give you a fun and memorable time for you and your hen party in Northern Ireland! With hen party games and adventures, experiences that you might not typically associate with a hen party. We offer a wide range of hen party packages with most popular activities being Coasteering (Click here for info. sheet) and our Sea Safari Boat Trips (Afternoon tea at Angus Rock Lighthouse Island OR restaurant lunch at Daft Eddies Island). Other options include archery, canoeing and our NEW Game of Thrones Costumed Archery Experience or Game of Thrones Glamping Northern Ireland Experience. Activity sessions can be anything from 2-hours to full day so you can easily fit it in around pamper sessions, happy hour, first orders, last orders and all those other important hen night party Belfast rituals! * Collecting everyone by coach in Belfast City Centre and bringing you down to our hen party centre. 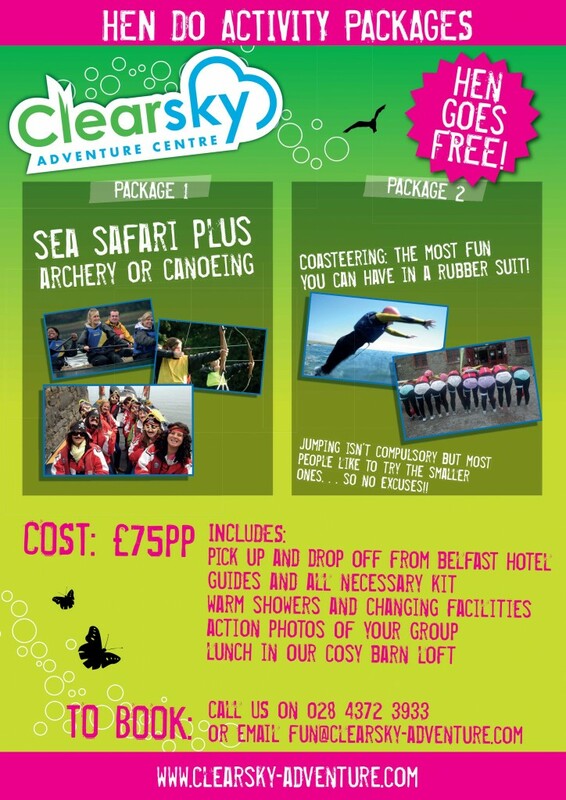 * Ensuring the girls have great craic on activities and the Hen definitely has a day to remember! So, consider a new set of hen activities and still have time for your hen night out in Belfast.